US, 1996, 120 minutes, Colour. Clint Eastwood, Ed Harris, Gene Hackman, Laura Linney, Judy Davis, Scott Glenn, E.G.Marshall, Denis Haysbert, Melora Hardin. As we know, this power corrupts absolutely. Here the power is at the US top, a cover-up of a crime to protect the powerful. But, the key to the exposure of the crime is an ageing thief with a sense of honour. Clint Eastwood both directs and acts as the thief. The film is a good-looking thriller with a strong cast including Gene Hackman as the President, Judy Davis as his chief of staff and Ed Harris is chief detective. There is also an interesting father-daughter theme accompanying the conspiracy which gives it all the more human interest. Not as intense as some thrillers but stylish and absorbing. 1.The focus of the title, the saying about absolute power corrupting absolutely? America and absolute power, in the form of the American President, his government? The contrast with Luther Witney as the loner and his absolute power and exercise of it to confront the corruption of the President? 2.The conventions of the thriller, the action drama, the detective thriller, the political thriller? The combination of these elements? The build-up to a political coup and the overthrow of a government? 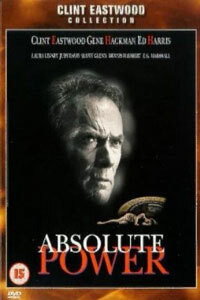 4.A film by Clint Eastwood and his perspective: his work as director and his finesse in making this thriller, as an actor and his screen persona, the background of the westerns, his coming into the city, the criminal with his code, the witness to evil and his becoming the avenging angel wanting to right wrongs? Yet doing this unobtrusively and behind the scenes? His interest in political themes? 5.The introduction to Luther Witney: the art gallery, the religious motifs, his copying the paintings, going home, the place of the key, his meal, his orderly life, the drawing of the mansion and the transition to the mansion? His entering the house, his skill with disarming the security system? The close attention to the details of the theft, the wealth? The tension with people coming into the house? His being caught, sitting in the chair (and its later irony), watching, his inaction, his horror? The ingenuity of his escape? The pursuit by the security guards, even with their lights for the darkness? His getting away? 6.Clint Eastwood's depiction of Luther Witney: age, craggy, his life and crimes, his absence from his wife and daughter? His grief over his wife's death and her devotion to him? His watching over Kate - without her realising it? Going to ceremonies, the collection of photos, fixing the food in her fridge? Going to see her when she was jogging? His decision to leave? Going to the woman to get a false passport and disguise? The dangers for him in his seeing what the President did? The build-up to his leaving, going to the airport, watching the television press conference and his disgust at the President, his returning? Seth seeking him out and their hypothetical discussion about how a thief could get into the building and disarm the security? The White House tour and his presence, leaving the photo? The jewellery for the Chief of Staff? Forging the President's signature? The discussions with Kate, the build-up to the set-up, the shooting and his being a target of the police as well as the wealthy man's hitman? His shrewdness in escaping as a policeman? His being in Kate's house, overhearing the conversation with Seth? The fridge? The phone call, his concern about Kate, his return, finding the crashed vehicle? Going to the hospital and killing the security guard trying to murder Kate? His turning up as the chauffeur of the wealthy man? Their discussions, delivering him at the White House, his manoeuvring of the President's death? His listening to the TV about what had happened? His return to Kate, the suggestion that she have Seth over for dinner? The loner with the crooked and criminal background yet having the sense of honour to rectify everything corrupt in the American political system? 7.Kate and her studying of law, jogging, relating and not relating to her father, their discussions, her fear that he was the killer? The questioning by Seth, her resistance, her liking Seth? His persuading her to the set-up? Her arrival, the discussions with her father, the shots? The jogging and the Secret Service man pushing her car over the cliff? Hospital, the attempt on her life in hospital? The reconciliation? Her growing awareness of her father's love for her, especially by the photos in his house? A future with Seth? 8.Seth and his staff, their skill at their work? The detail of police and detective work? His discussions with Luther in the bar? The contact with the wealthy man behind the President? The Secret Service and their wanting co-operation (and bugging his phone)? The decision to have the set-up, the plan, the briefing, the shooting and the chaos? The revelation of the truth? His arresting Gloria? The Secret Service men and their deaths? His relationship with Kate, his shyness and awkwardness, a future? 9.The build-up to the incident with the president? The presumption of the president, his character, carrying on with Walter Sullivan’s wife? His friendship with Walter Sullivan, the betrayal? The interaction, the sexual frenzy, the reaction, Christy and her behaviour? The violence of the president? Christy’s death? Luther watching, helpless? The knife? The Secret Service and their shooting? Gloria and her arrival, the detailed cleaning up, the cover-up? The realisation about Whitney? The pursuit of him, his escaping through the woods? Leaving behind the letter-opener? 10.The social background of the president, his calling the press conference, his expressions of grief? The style of leadership, the president and his double standards, hypocrisy? Popularity? His concealing the facts, the Secret Service helping? Gloria and her promotion, dancing with the president, thinking that the gift, left by Whitney, was from him? Her own downfall? 11.The Secret Service agents, their background, the setting up of the assassination of Whitney? The bugs? The tapes? The violence in the name of security for the president? The attempt to kill Whitney’s daughter, pushing the car over the cliff? Attempting to kill her in the hospital? Whitney encountering him, the lethal injection, his being killed with the syringe? The change of conscience for Bill Burton, his feeling bad? His suicide? The film’s comment on loyalty to the president? Power at all cost? Loyalty at all cost? 12.The character of Gloria, her role in the White House, her taking charge in the Sullivan Room? Her skill in the cover-up? Her own personality, ambitions, nervy? Ultimately ruthless? Finding the necklace, presuming it was from the president? Dancing with him? Her arrest? 13.Walter Sullivan, his role as the elder statesman, his relationship with the president? His marriage, the behaviour of his wife? The president’s statement, support and sympathy? Whitney and his communicating with Sullivan, indicating the truth, the evidence of the letter-opener? Sullivan and his disillusionment, his going to see the president, confronting him? 14.The finale, the story on television, the president killing himself with the letter-opener? The arrests? Justice not seen to be done – but done? The contrast with Whitney, the possibility of a life, reconciliation with his daughter?